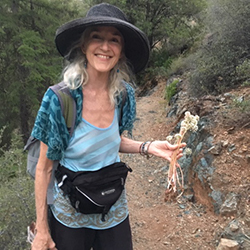 I have been a guide for Mount Tamalpais State Park and Sugarloaf State Park for many years, leading various walks and hikes, specializing in wildflower ID and edible and medicinal plants. I was in the first cohort training with The Association for Nature and Forest Therapy, and for the last two years have been the coordinator for the Forest Therapy Series of walks at Sugarloaf State Park. I am a floral designer and events coordinator by profession, but continue to have a growing passion and sensitivity for the healing and balancing properties of the Forest Bathing practice.